Alfalfa hay buyers and sellers now have a way to know the relative feed value (RFV) of every bale. A new on-baler system calculates and records RFV as each bale is made, and can assign that value by attaching an RFID tag to the bale’s string. The new precision measurement system has been developed by Harvest Tec, the company responsible for pioneering many advancements for harvesting quality hay. Hay producers who tested the new system believe it will potentially revolutionize the way RFV is measured and recorded. The significance of this development stems from the extreme variation found in alfalfa RFV. Values can range from lows of 100 points to over 250, affected by several factors including plant variety, maturity at cutting, or any of several handling and harvesting conditions. Consequently, the monetary value of the hay varies greatly, meaning that the seller could be paid less than his hay is worth, or the buyer may be paying more than its actual value. The new Harvest Tec system adds the element of fairness to those transactions. For alfalfa producers and buyers, the standard practice for gaining an indication of the hay’s quality is through random bale core sampling. It’s commonly understood that two core samples taken from the same bale or windrow can be different, and especially for samples taken from various parts of a field. Two bales made minutes apart can vary twenty to thirty points in RFV. David Sharp of Roll, Arizona is another hay producer who participated in the test. Sharp harvests eight cuttings of alfalfa each year from 1,500 acres. He said, “We all know that with alfalfa, 90% of the plant’s feed value is in the leaf. Leaves pack better than stems. Therefore, the more leaf content you can get into the bale the better the quality of the hay. We also know that higher leaf content means more bale density and higher bale weights”. It is well known in the industry that bales with greater density contain more leaves. That’s because leaves pack much better than stems. A bale with high leaf content has higher feed value and, consequently, greater density. The leaf to stem ratio can be influenced by several factors. Leaves are flat, and compress nicely, adding weight to the bale. Bales with more stems will always weigh less. Stems are round and stiff, and do not pack as well. Harvest Tec’s innovative system consistently calculates the RFV of each bale by measuring the key factors of moisture, bale weight and density. 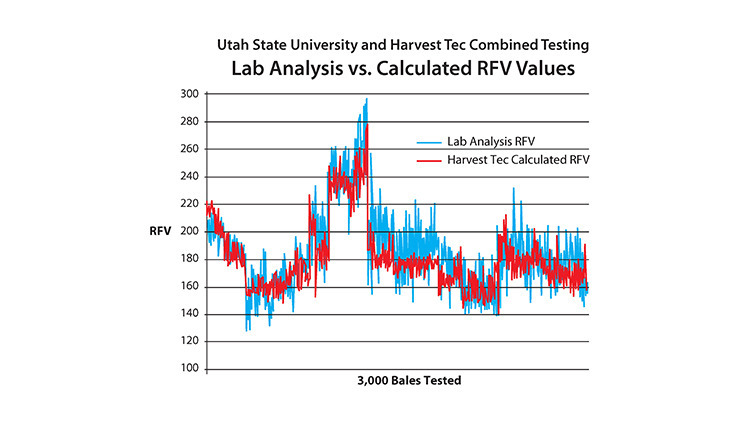 From those measured variables, the Harvest Tec system can accurately determine the RFV oft he bale. The producer takes a hay sample just before or after the field is cut, and gets a lab RFV analysis. That value is entered into the Harvest Tec system when baling begins. As the baler operates, Harvest Tec’s dual star wheel sensors take hay moisture readings 96 times every 3 seconds to achieve moisture measurement of plus or minus one percent accuracy. Next,the baler’s scale provides bale weight accuracy within 2 percentage points. From the moisture and weight data, the Harvest Tec system calculates the dry matter density and the relative feed value of each individual bale. How accurate is the new Harvest Tec RFV calculator system? Realizing it would be a significant change for feeders, growers and hay buyers to accept the calculated RFV instead of lab analysis, the new system was tested on 8 farms across 6 different states, with more than 3,000 bales individually cored and analyzed. The research was done with baling in different temperatures, varieties and cuttings. It included both irrigated and non-irrigated fields, along with different makes of balers and bale sizes. The comparative results of the extensive testing once again demonstrated that the values measured by the Harvest Tec RFV calculator system closely follow the values from the lab coring analysis. During the baling process, the new system’s processor displays the RFV on the monitor screen, and writes each bale’s RFV and TDN to a job record that can later be printed out. It also determines average values for that job or field. “It‘s really nice to watch the quality of the hay as webale,” states Gary McManus from Lakeview, Oregon. “When the hay starts to dry out and lose its leaves, the RFV starts to drop on the screen. I can decide when to shut down knowing what the impact is on RFV. Wetested the RFV calculator on over 300 bales and the results were very close to the individual cores that we had taken from both ends of each bale. The best way to record and utilize these precision RFV values is to apply an electronically readable tag to each bale. Harvest Tec’s bale “tagger” applies a vinyl tag containing an RFID chip to the twine on the bale. The tagger system writes valuable information to the tag including bale moisture, weight and relative feed value. It also records bale number, the time the bale was made, field location, and more. The tag’s recorded data can be read back using either a hand held scanner or one that mounts directly to bale handling machines. Some farms using the systems can the bales as they come out of the field, sorting them by RFV into low, medium and high quality groups. Sorting canal so be done when the hay is stacked for feeding or as a truck is loaded. This way, hay producers and sellers can give the buyer precisely the hay quality he wants. Harvest Tec’s portal scanner will scan entire loads as the truck passes under it, reading the data directly into a computer. This makes it easy to sort bale loads, and for keeping track of inventory. According to Dr. Young who conducted the study at Utah State, the advantage in identifying the RFV is significant, especially for dairy producers. He states,“Sorting and feeding hay according to its quality allows for ration adjustments in order to keep milk production consistent without unknowingly under or overfeeding metabolizable protein and metabolizable energy.” Dr. Young goes on to say, “There are potential cost savings by feeding what the cow needs rather than giving her a roller coaster diet. Lower quality hay can be fed to dry cows or heifers. Feeding the high quality hay to high producing cows, and not underfeeding them with lower quality alfalfa can translate to a daily increase of nearly 4 lbs of milk per cow,” said Dr. Young. Based on the comprehensive research results, the operators of the test farms are excited about the prospect of using the new Harvest Tec system and its calculated RFV values to market their hay. Randomly coring bales to determine RFV is being replaced by this new technology. The precision farming way to determine and manage hay quality is to measure the whole bale at the time it is produced, tag it that way, ship it that way and feed it that way. Harvest Tec’s new on-baler RFV calculator system is available through major large square baler manufacturers. For more information, visit www.harvesttec.com or call (800) 635-7468.